Q #1: What is the "Two Week Wonder" program about? A #1: It is all about assisting you, the builder, with the assembly of your own two-seat Zenith kit aircraft in a two-week time frame. Our Specialists will make sure that you will succeed! Note: We also provide a similar program for Zenair's four-seat designs (CH 801-HD/SD; CH 640) but more time is necessary for these larger aircraft (call for details). Q #2: Really? In just 2 weeks, I can build my own 2-place all metal aircraft. How is this possible? A #2: When you arrive at the Plane-crafters shop, we will have an Advanced Quick Built 49% kit waiting for you to finish - with assistance from our staff. Our technicians will train you and assist you so that you will spend 100% of your time assembling the aircraft. We believe that the average builder typically spends up to 70% of his/her time looking over the drawings, manuals, finding the right tools, getting the right parts, etc. With the Two Week Wonder, you will be spending 100% of your time working on the aircraft because our great staff will make sure you only spend time assembling. Q #3: Are there other companies offering such programs? A #3: Yes, the most popular is http://www.glasairaviation.com/twtt.html. Their program is also 2 weeks but the aircraft is a 4 place. So if they can do it, we really can, with our easy to assemble kit! Q #4: I live in the USA, so how do I get started? A #4: Contact Michael Heintz (705-526-2871) who will assist you with the definition of your unique aircraft: Engine, instruments, options, etc. Based on your selections, you'll receive a customized quote (which you will be able to fine-tuned until the order is confirmed). Q #5: OK. So, after I am satisfied with my quote? A #5: You then complete the assembly contract with Plane-Crafters for the Two Week Wonder program and send the deposit. Plane-Crafters will schedule your visit and will begin to prepare for your program: Get your Quick Built airframe, order the engine, the avionics, etc. Q #6: Got it. So after I have paid the deposit, when do I come and finish my aircraft? A #6: It will take a few weeks for Plane-Crafters to receive the kit from Zenith Aircraft, and a few more to assemble it to the quick built kit stage. So generally, once you have confirmed your order with your deposit, you can expect your "Two-Week-Wonder" program to start within 8-10 weeks. Scheduling of the programs, however, also depends on how many other builders like yourself are in line. So call us well in advance of your desired program dates to discuss the scheduling of your "Two-Week-Wonder"! Q #7: So, the Zenith Aircraft kit is not 49% complete? A #7: Correct. The FAA has evaluated the Zenith Aircraft kit and has concluded that it only represents 26.7% of the total aircraft. So, Plane-Crafters takes the 26.7% kit to the 49% stage, to the level of our QBK. You will finish the remaining 51% at Plane-Crafters. Q #8: Got it. So I finish the aircraft at Plane-Crafters' - Now what? A #8: Yes, at the end of the two-week program, the aircraft will be ready for you to take home or to your local airport for final inspection by the FAA (DAR). Plane-Crafters is done with your project once the engine has been started, the avionics have been tested, and once you have completed the first detailed pre-flight inspection - and yes, you'll have a chance to taxi the aircraft before you leave us! 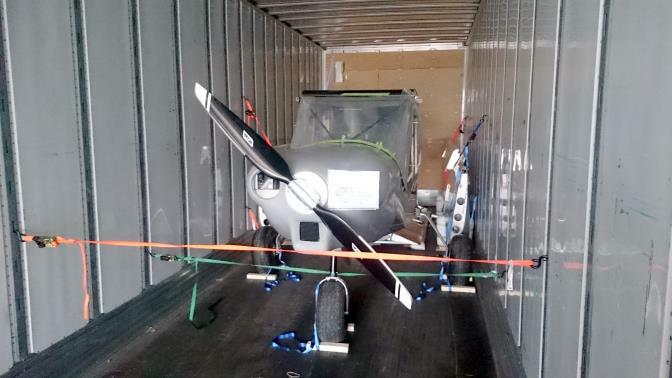 You trailer the aircraft home or Plane-Crafters will arrange transportation. 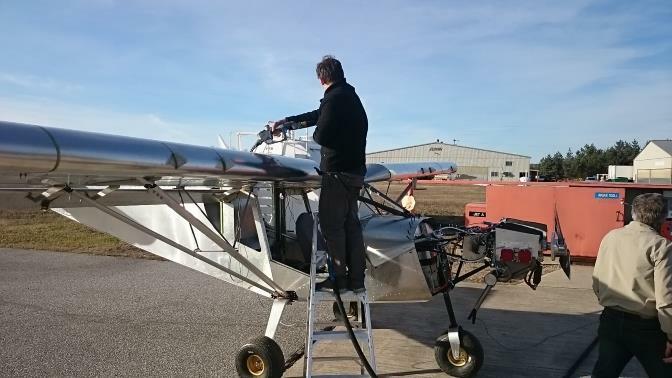 Once home, you will ideally have some space available at your local airport so that you can re-install the wings and tail sections - in preparation for your FAA representative and his final inspection of the project. Q #9: What about USA customers when crossing the border or when shipping? A #9: Plane-Crafters will take care of that with its broker. There are no duties on Civil Aircraft goods crossing between Canada and the USA. Q #10: What about the FAA, what do they need for the Certificate of Airworthiness? ﻿﻿Q #11: Can Plane-Crafters help with with the FAA forms? Q #12: I noticed that you are asking the same price ($109,900.00 USD) for the Experimental Light Sport CH750 Cruzer, STOL CH750 or Zenith 650. Whats up with that, since the standard kits are not all priced the same? A #12: Yes, the "Two-Week-Wonder" program is the same price for all three models. The Cruzer kit from Zenith Aircraft is the most advanced and therefore the fastest for Plane-Crafters to assemble to the quick built stage. The STOL is not far behind with the 650 taking the longest. Since the 650 takes the longest to assemble but the airframe kit is less expensive, the total cost come to the same as for the Cruzer. All three designs are very similar in design, use the same types of materials, same firewall forward, avionics, etc. Chris Heintz, designer of these aircraft did an excellent job designing these as similar two-seat sport-planes..
Q #13: What "Skills" do I need to successfully complete a "Two-Week-Wonder"? A #13: Basic technical skills are an asset (know your common tools and how to use them), but more important will be your attitude. Be ready to work, ready to listen, to follow instruction and to see results! For the program to be successful, we count on you being motivated and involved. A lot of preparation goes into the project even before the program begins (selecting engine, instruments, options, etc. ), so also make sure to specify your choices in time for us to order and prepare everything. Q #14: Will it really only take Two Weeks to complete my aircraft? A #14: Yes, the standard program takes two week, and you will be able to taxi your aircraft by the end of the program! During those two weeks, we expect you to be present every day, and to actively participate in the assembly process, as instructed. If two weeks sounds too intense for you, we can customize and extend the program another week or two (call us to discuss your needs or concerns). As you might expect, preparations for the program begin many weeks in advance (see above), and you'll still need a bit of time after the program to transport, finish, register and insure the completed aircraft. After that, you're looking at years of flying fun and adventures! Q #19: Where can I stay in the area? A: #19: There are many local motels and hotels. Local Motorhome "camping" is also available. Q #20: This all sounds really amazing - I believe I can do this! I have picked my aircraft model and have selected my options, what do I do next? A #20: Call Michael Heintz (705-526-2871) or send him an e-mail; He will send you a quote and call you to discuss scheduling possibilities! Q #1: Registering my aircraft in Canada? A #1: Canadians have two options for registering their Two-Week-Wonder aircraft: Experimental/Homebuilt or Advanced Ultralight (AULA). There are pros and cons to both aircraft categories, so make sure you understand these before you make your choice. For additional information, you can contact the RAA and/or UPAC, or Transport Canada. Q #2: Can you outline the main differences (between E-AB and AULA) and how they affect the Two-Week-Wonder program? 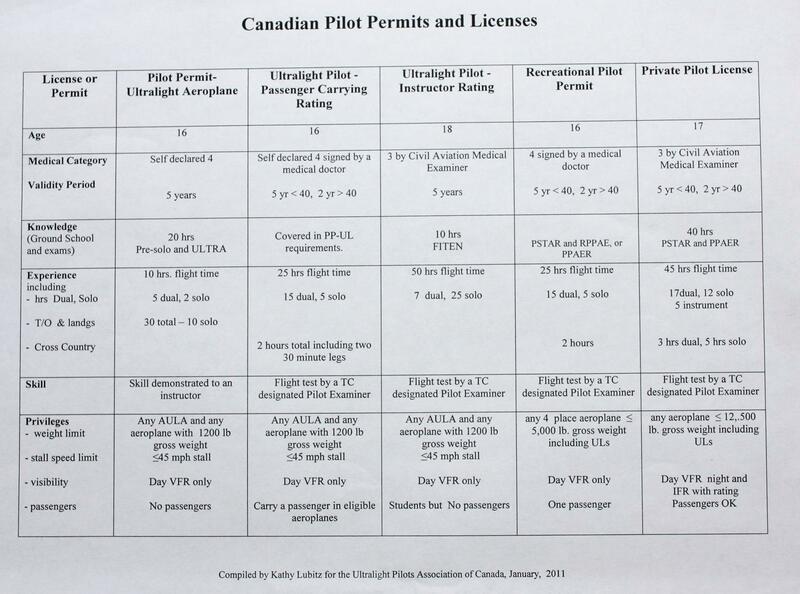 To operate an Experimental/Homebuilt aircraft in Canada, you will need a standard PPL or Recreational Pilot license. B) Advanced Ultralight (AULA): Besides the absence of MD-RA inspections prior to registration, there are two additional advantages to registering your aircraft as an AULA: You will be able to fly it with an Ultralight Pilot License, and you will be able to use the aircraft as a trainer (in a flying school)... Disadvantages include: Limited Gross Weight of 1,232 lbs (therefore lowered useful load) and no other engine choice than the Rotax 912 series... For more details on the advantages and restrictions applicable to AULA, see HERE. The most hassle-free solution to building your aircraft through the Two-Week-Wonder program is therefore to register the finished aircraft as an AULA. Only do this, however, if you are happy with the rights and privileges as they apply to AULA pilots. Good to know: Under Canadian law (CARS Subsection 507.03 (b) and Section 549.01), the builder/owner of a kit aircraft may"contract for professional assistance in the construction or assembly of parts of his/her aircraft provided the work is subject to the builder's overall control". This relatively new and uniquely Canadian regulation pre-empts earlier legislation requiring kit builders to complete 51% of their aircraft themselves (still a requirement for U.S. builders - see FAA). Amateur Builders in Canada may therefore contract professional assistance up to 100% provided they control the overall build of their "E-AB" aircraft. 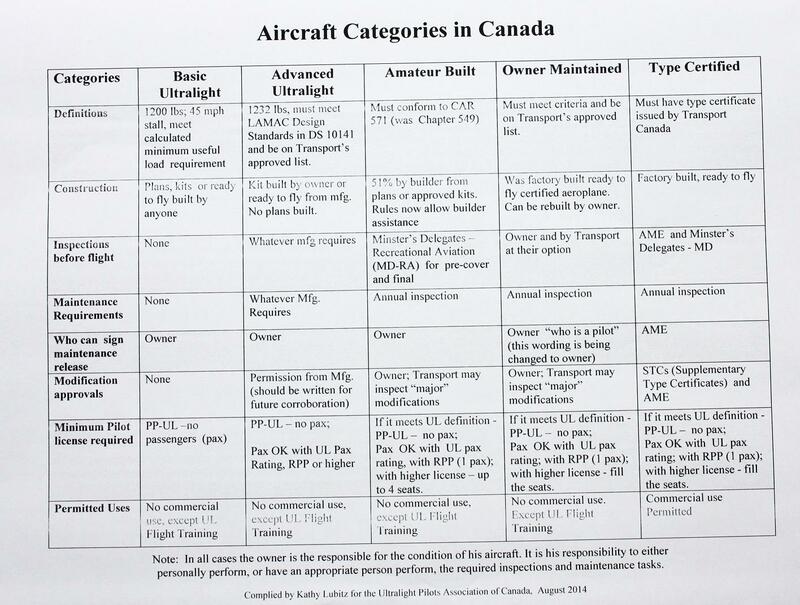 Q #4: So based on the above, can I build a Canadian Homebuilt in 2 weeks at Plane-Crafters? A #4: Yes, but only if/when we can coordinate the pre-closing inspection during your 2 weeks stay with us. Ideally, you will finish the wings and tail sections during your first week here so that they can be inspected by an MD-RA during a pre-scheduled inspection. We will of course help coordinate this with our local MD-RA inspector. The final inspection will need to be done at your place, with your own local inspector. Q : Who are Zenair Ltd., Zenith Aircraft Co. and Plane-Crafters Inc? A : Zenair Ltd is the original Chris Heintz company started in 1974. The Zenair facility is Transport Canada certified for the designing and manufacturing of the Type Certified CH2000 aircraft. Zenair has an engineering team, designs and manufactures aircraft kits, assemblies and components for designs such as the CH640, CH 650, CH 750, CH801 (2 & 4 place aircraft). Zenair also develops Firewall Forward Packages (FWF) for various engine choices for all CH designs, and also manufactures kits for six sizes of aluminum aircraft floats. Both Plane-Crafters and Zenair are located at the Huronia Airport in Midland ON Canada. Zenith Aircraft Co is located in the USA and manufactures the airframe kits of the two-seat STOL, Cruzer and Zenith CH 650. Zenith Aircraft Co is independently owned and well known as one of the most successful kit aircraft manufacturers in the world. All three companies focus on Chris Heintz' (CH) aircraft designs. Plane-Crafters Inc. is an independent organization whose mission it is to assist Zenith/Zenair aircraft kit builders with the assembly of their kits. We will make sure that you succeed! The "One Week Wonder" (pictured above) was assembled in 7-days during the AirVenture (Oshkosh) Convention in 2014. This successful project is the inspiration for Plane-Crafter's new "Two-Week-Wonder" programs.